With a few tweaks these turned out delicious! Even I could not resist them and I usually am not too into muffins! Better still, they are gluten-free, vegan and have vegetables in them - what more could you ask for?? You can make a big batch and put some in the freezer to pull out when you are in a pinch or have company coming! Preheat the oven to 350 degrees on the bake setting. Add your chia and 5-6 Tbsp water in a small bowl to gel. 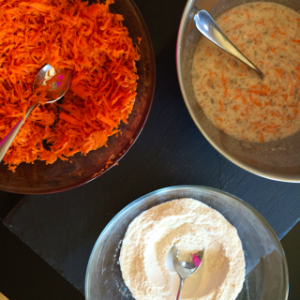 In another large bowl, mix the dry ingredients: almond flour, baking powder, baking soda, sea salt, stevia. Then in a new bowl, mash the banana first, add the honey, coconut milk and once gelled, the chia. Mix this together and then pour wet ingredients into the dry and lightly fold in. 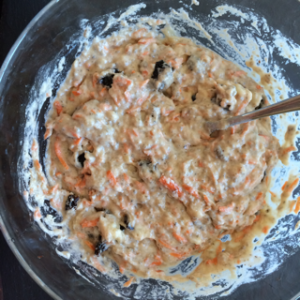 Add the shredded carrots to the mixture and then add the chopped plums - you can do more or less to your taste. Scoop the muffin mix into a greased muffin tin or use a paper liner or the silicon kind and bake for 25 - 35 minutes until the muffins are lightly browned. Let cool and then store in a container or freeze for later! Chewy with a light banana taste! Yum! I gave this new version to my husband with a glass of unsweetened flax milk - much better! Try this recipe and let me know how you like it! And if you know someone who might enjoy it share it with them!